LV-A's 21st Annual "Letters for Literacy"
Carriage House Plus, Lewiston, Maine. Thank you to all who played, volunteered and donated to make Scrabble Fest 2018 a success. Tournament rules, players' Registration forms, pledge forms, and tips on team play. We hope to promote the value of education and literacy through the use of this famous word game, and we offer Scrabble Fest as our annual fundraiser. Play Scrabble! Form a team of four players, collect pledges, and join us in an afternoon of fun. The requested entrance fee is $15 per player/$60 per team. For Registration and pledge forms and additional info, click here. 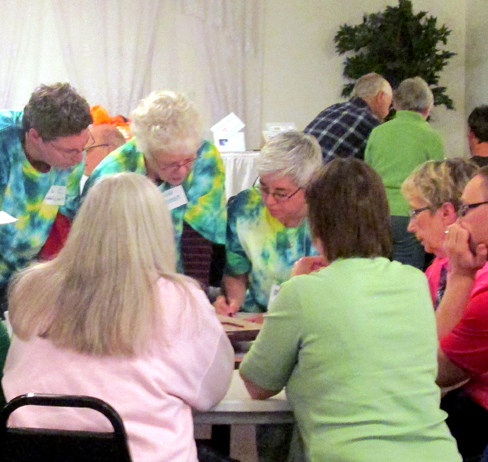 Become a Scrabble Fest Sponsor. For more info on sponsorship, click here. Donate a prize. For more info on sponsorship, click here. Literacy Volunteers-Androscoggin has made a life-changing difference to many adults and families in our area. Please consider giving the gift that will keep on giving for generations to come. © 2018 Literacy Volunteers-Androscoggin. All rights reserved.